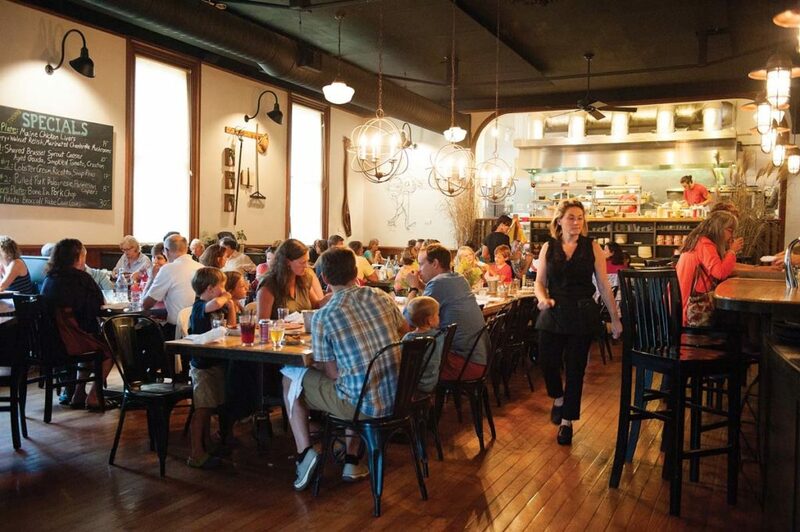 Gather sets an inviting, casual tone for dinner, appealing to families and friends. Diners can enjoy the covered deck long after the summer months. 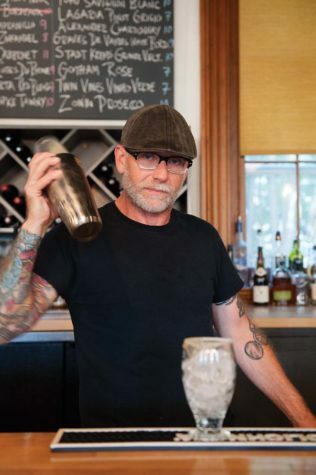 Gather bartender Eric Morabito may be one of the most popular men in Yarmouth. Yarmouth’s old Masonic hall has a history as a gathering spot. Fifteen years ago, my husband and I sat in the living room of a riverfront home shown to us by a real estate agent. I wasn’t sure what town we were in, but I knew I wanted to live here. “This is Yarmouth,” said the agent, helpfully. “Okay, then,” I replied. We made the move and my family has lived happily in Yarmouth, 12 miles north of Portland, since then. Call it serendipity or blissful ignorance; we made the right choice for ourselves when we left Massachusetts for Maine. Main Street and the surrounding village is one of the most appealing features of Yarmouth, with easy walkability and a small selection of shops and restaurants. As we settled into our new home, we explored these places, seeking out spots we could shop and eat locally. The culinary scene in Portland was just starting to bloom, but it was important to find places close to home as well. We discovered the Royal River Grill House, and it quickly became our go-to place in town, for either a family dinner or entertaining guests. It has a prime location on the Royal River, and we loved the wide views of the marina, boat traffic, and, if we were lucky, some wildlife. The friendly staff soon greeted us by name. We came to rely on the Royal River Grill House for a big bowl of mussels or a great burger, and as the place to meet up with our new friends. This past year and a half has brought some extraordinary changes to the Royal River Grill House. Nicola Manganello Harnden of Nicola’s Home, daughter of the restaurant’s owners, had been advocating for an update for quite some time. “I’d been begging my dad for years,” she tells me. 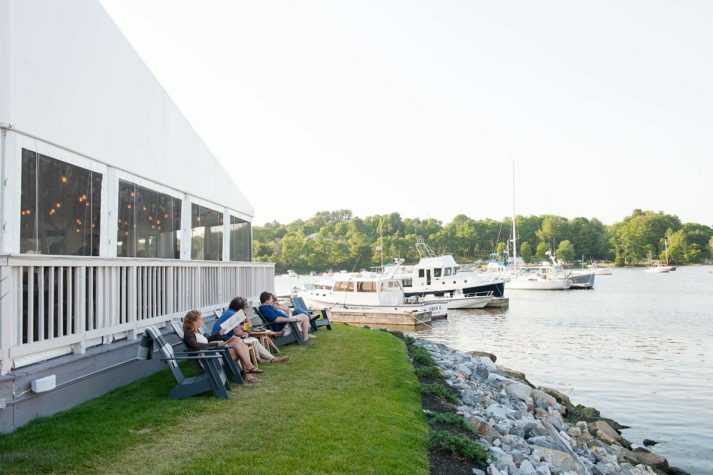 “I said, if you build it they will come.” Ed Manganello finally agreed in early 2015, Harnden says, “and suddenly it was a go.” She canceled a vacation, they shut down the restaurant for two weeks, and they gave the space a major overhaul. “I have no experience in the restaurant business,” she says, “other than liking to dine out.” General manager Tony Merrill, on the other hand, had no experience in interior design. Putting their disparate skill sets to work, the two managed to balance design with function. “I would come up with an idea, then bring it to Tony to see if it would work,” says Harnden. like, with an expansive panorama of the marina. The room’s most striking feature is a knotted rope chandelier that covers the entire ceiling, providing not just illumination, but a conversation piece as well. “It took my staff three weeks to braid it by hand,” says Nicola. 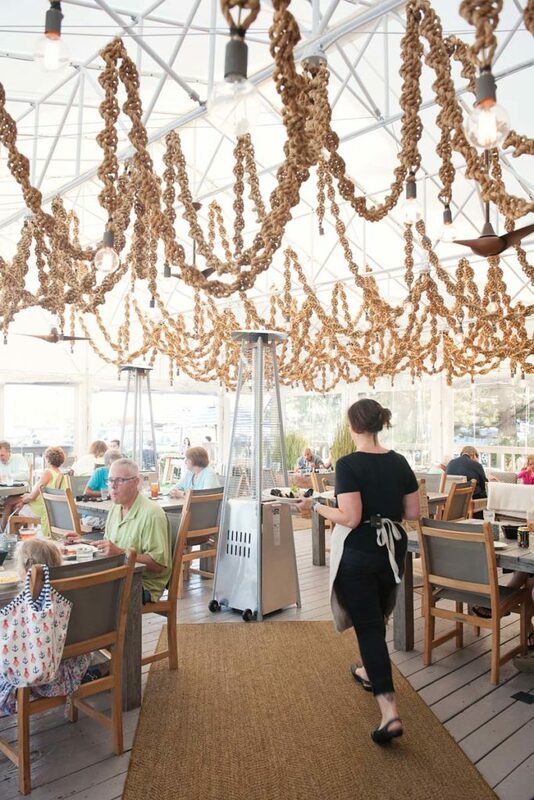 Big space heaters assure that the deck will be available to diners well past the summer months. And just outside on the lawn, there are new fire pits and Adirondack chairs, draped thoughtfully with blankets for when the sun sets and the air cools. Yarmouth’s population is growing. New neighborhoods are springing up and the school system is drawing in young families from Portland, as well as from out of state. The need, and desire, for varied dining options has not gone unnoticed. Resident Matt Chappell, who has worked in kitchens since the age of 14, hadn’t been considering a restaurant of his own until a winter day four years ago. He was skating with his boys at the pond across the street from the old Masonic hall on Main Street when a “For Lease” sign on the distinctive building caught his eye. “The space has a history of being used for public gatherings—voting, bean suppers, dances. I was inspired by that to open a neighborhood restaurant, the kind of thing I thought was missing from town,” Chappell tells me. His plan: serve good food from Maine to people in the neighborhood, keeping it all as local as possible. 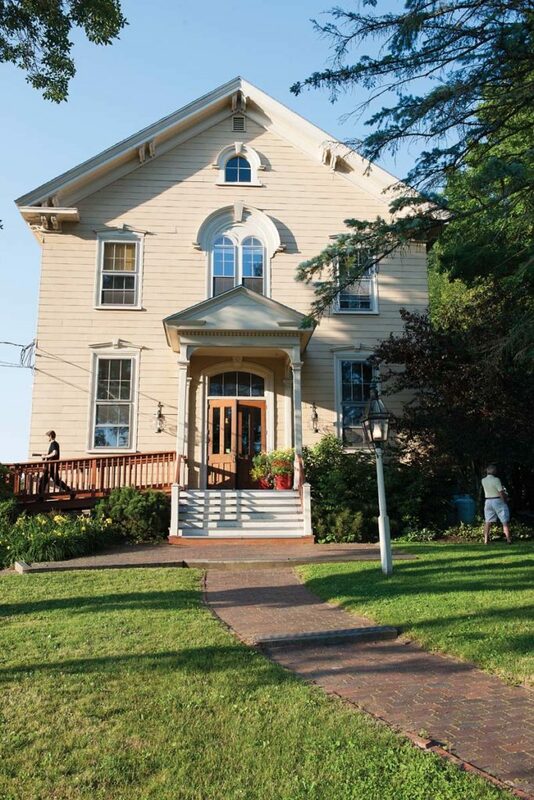 After a complete renovation of the first floor, Gather opened in September of 2012, giving the old hall a new life. The spacious room was transformed by local contractors and designers. “It’s important to make intentional choices about how to operate,” says Chappell. “I want to keep the money in the community.” Chappell had a good idea of how he wanted it to look, and more importantly, how the place should feel. Lots of original wood lends a warming quality. Tall, shaded windows diffuse light and, along with the worn-metal chandeliers, give Gather a pleasing glow. The centerpiece of the room is a long communal table, crafted from a piece of a shuttered bowling alley that Chappell picked up in the town of Randolph. It’s a popular spot for larger groups, extended families, and spontaneous gatherings, especially handy when you run into friends and want them to join you for dinner. “Every time someone walks in and sees friends at another table, that lives up to what I hoped for,” Chappell says. Chappell is thoroughly committed to Maine food. A chalkboard by the bar lists the local farms and purveyors that he buys from. He even uses a barter system, exchanging produce from neighbors’ backyard gardens for restaurant credit. “I don’t want to just pay lip service to local food,” he says, and it’s clear that he’s not. Whole animals arrive from nearby farms, providing the basis for the daily butcher’s plate special. Chef Colin Kelly and his team are thoroughly enjoying this process, creating new dishes with little to no waste. Recent offerings include chorizo meatloaf and charcuterie platters. Acadian rockfish, an underutilized white fish from the Gulf of Maine, has replaced salmon on the menu. “It’s a little bit of a gamble,” says Chappell, “because it’s an unknown. But it helps meet our goal of having two-thirds of the menu sourced locally.” Gather’s pizzas are also always a favorite, with chewy crusts and creative toppings. Like many residents of Yarmouth, Chappell takes an active interest in what’s going on in town. “Main Street just keeps getting better,” he says. 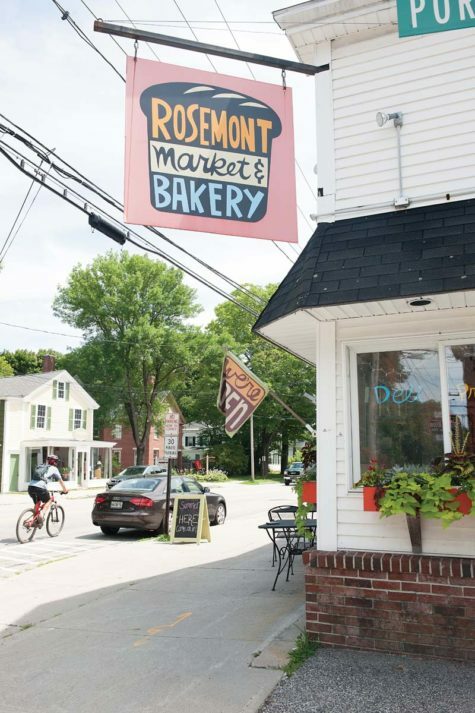 A few blocks east of his restaurant is Rosemont Market and Bakery, a thriving specialty store for wine, produce, cheese, and more. The market has the well-loved look of a place that’s been a fixture forever, but it opened six years ago. It’s been a welcome addition to town for a freshly baked baguette, cheese, and a quick conversation with a friend you’ve been trying to catch up with. In the other direction, at the intersection of Main and West Elm, Handy’s Market and Cafe is another village fixture that recently received a makeover. New owners Amy and Sean Ireland have brought in offerings from Otto Pizza, Bard Coffee, and The Holy Donut, which can be enjoyed in the new carriage house or on the stone patio. They also stock a surprising array of gourmet groceries and snacks. 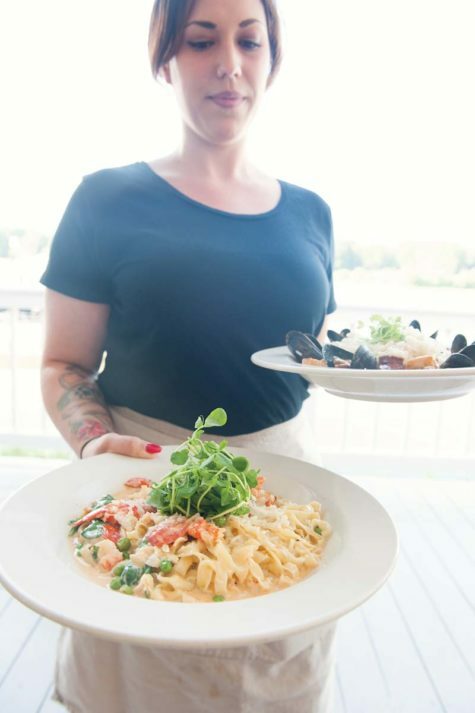 The changes to Yarmouth’s restaurant scene extend beyond Main Street. Maple’s, on Route One, is now in the experienced hands of Robin Ray, who’s taken the place well beyond its origins as a gelato shop. With the encouragement of regular customers, she now bakes up scones, cookies, exceptional bagels, and other tempting treats from the expanded kitchen. Ray’s friendly staff includes her children, sisters, and friends, all with the same sunny, positive personalities. “When we’re here together,” says Ray, “we never have a bad day.” Clayton’s Cafe and Bakery, long a lunchtime favorite, has freshened up its space on Route One, where patrons line up for hearty sandwiches, salads, and giant cookies. It’s been intriguing to watch the growth of Yarmouth’s culinary options. There’s a place for everyone, with each restaurant and cafe a reflection of the small town: neighborly, hospitable, and sociable. Wherever you go, it’ll be a taste of small- town life. 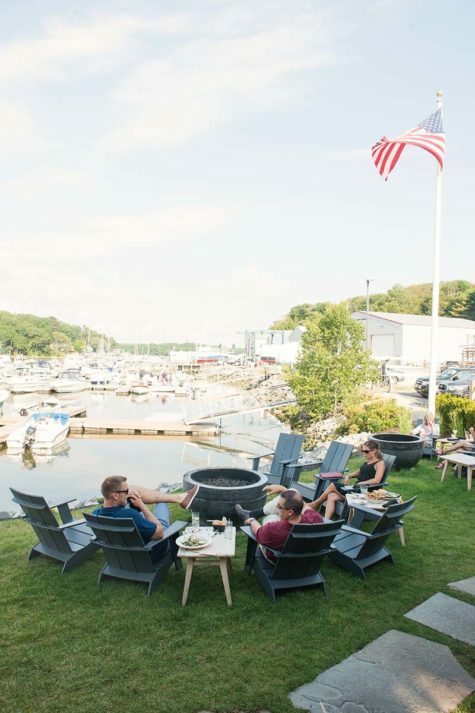 An enviable location makes the Royal River Grill House a destination for locals and visitors. Lobster pasta is a year-round favorite on the Royal River Grill House menu. 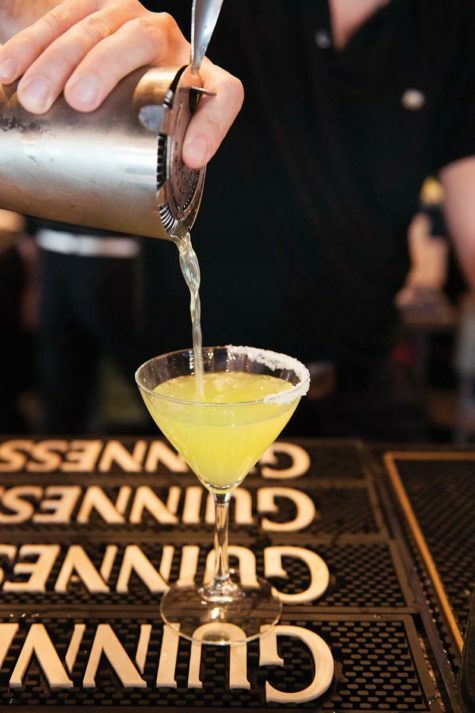 Meeting for drinks at the Royal River Grill House is always a good idea. Make one stop at Rosemont for bread, cheese, wine, and anything else you might need.